"Charlotte, Get Your Move On!" is a youth-focused initiative dedicated to improving the overall health and quality of life for Charlotte adolescents by empowering them to make positive behavioral decisions. Led by Teen Health Connection, this Friday and Saturday, April 8 and 9, the organization is holding events for the community. 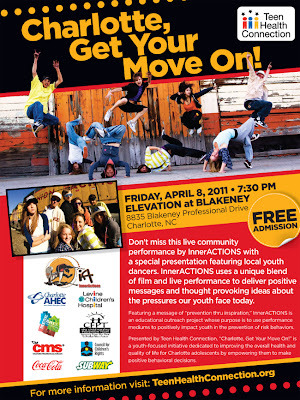 Friday's event is a Community Performance taking place 7:30 p.m. at Elevation at Blakeney (8835 Blakeney Professional Drive). The entire family is welcome to attend this event, which features a performance by InnerACTIONS, a teen educational outreach project from California that uses a blend of film and live performances to deliver positive messages and thought-provoking ideas about the pressures youth face today. Not only will you see the InnerACTIONS crew perform hip-hop dance, skits, and live music, but the event will also feature Charlotte-area youth dancers. Admission to this event is free, and it should be noted that mature themes will be presented (suicide, alcohol/drug use, and bullying) so it may not be appropriate for young children. On Saturday, CGYMO presents a Youth Conference from 9 a.m. to 3 p.m. at Northwest School of the Arts (1415 Beatties Ford Road). 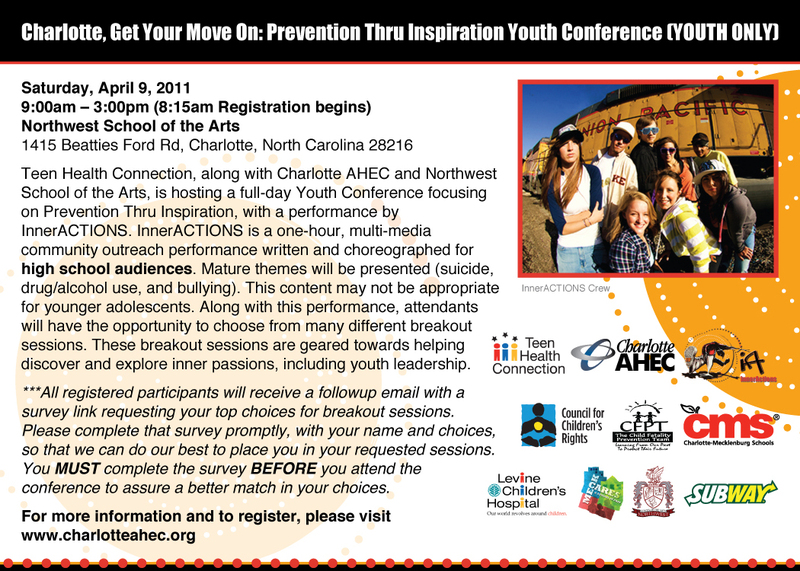 The conference will focus on "Prevention Thru Inspiration," and will feature a performance by InnerACTIONS. There will also be breakout sessions with professionals in fields such as music, fashion, journalism, auto mechanics, web design, photography, horticulture, and more. The goal of the sessions is to help attendees discover and explore inner passions, including youth leadership. 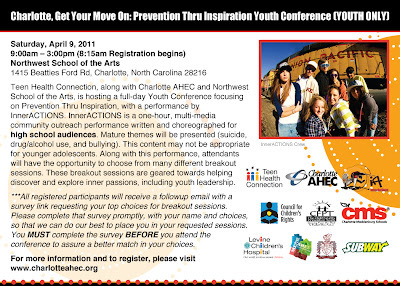 The conference is free to all teens, but pre-registration is required (click here). Lunch as well as T-shirts and goodie bags will be provided. For more details on Charlotte, Get Your Move On! and the upcoming events, visit www.teenhealthconnection.org. Below is a video clip of InnerACTIONS performing.